The best way to get from Saranda (Sarandë) to Tirana (Tiranë) is to travel by bus. Other than hiring a car, there are not too many other options available. If you are someone who likes to travel by train, forget it. Trains require flat ground and Albania is a mountainous country. There are a few railway routes between certain cities located in flatter areas, but trains are not a main mode of transport. Flying is not really a viable option either. The only way you can do it is to get the ferry from Saranda to Corfu and then fly from Corfu to Tirana. It’s an expensive way to go. A one-way ticket generally costs upwards of €170 and that’s in the off-season. It’s also worth being aware there are no direct flights from Corfu to Tirana. You have fly to Athens first and then take a connecting flight. It’s much quicker and easier to travel by bus. 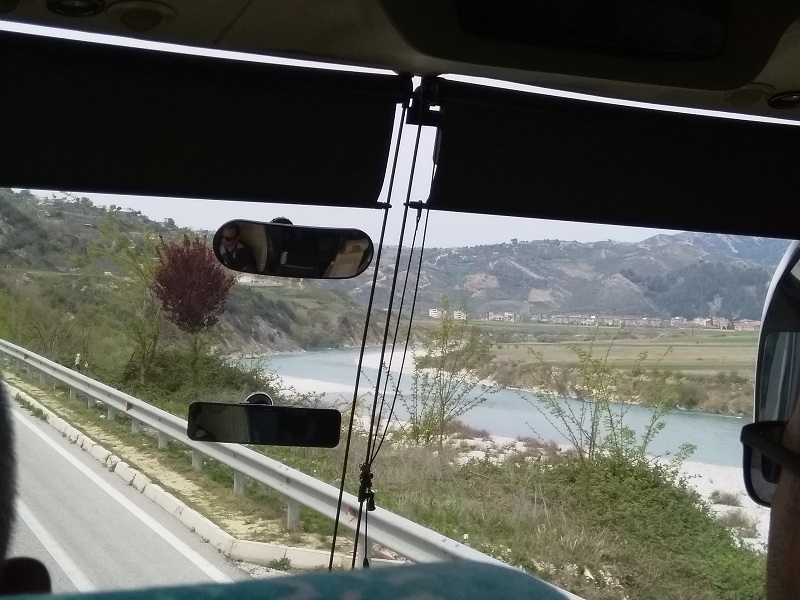 During the tourist season, there is a mini-bus service that travels between Saranda and Tirana via the coastal Route, but it costs around €40 per ticket. The normal bus service runs all through the year. There are 10 trips per day and it’s an incredibly cheap way to travel. You can buy a ticket for 1300 Lek. That’s only around €10. So, if you want to travel between Saranda and Tirana in the most economical way, going by bus is the best way. It cannot be beaten on price. As far as I know, it’s not possible to buy a bus ticket online. The seats are allocated using a more traditional system. The staff at the ticket office have seat plan written on paper. When they allocate a seat they simply cross it off on the plan. There’s absolutely nothing happening online. In fact, when I was in the ticket office I didn’t even see a computer. The ticket office is just behind the ruins of an old synagogue. It’s one of the main attractions in Saranda, so it’s not hard to find. The bus stop is also near the old synagogue. However, it’s located on the road in front of the plot of land the synagogue once stood on. The ticket office is located behind, at the top end of the plot of land, at the side of the road to the left of the crossroads. It’s a tall building and the ticket office in on the ground floor. Don’t go expecting to see a sign that says bus stop. There isn’t one. 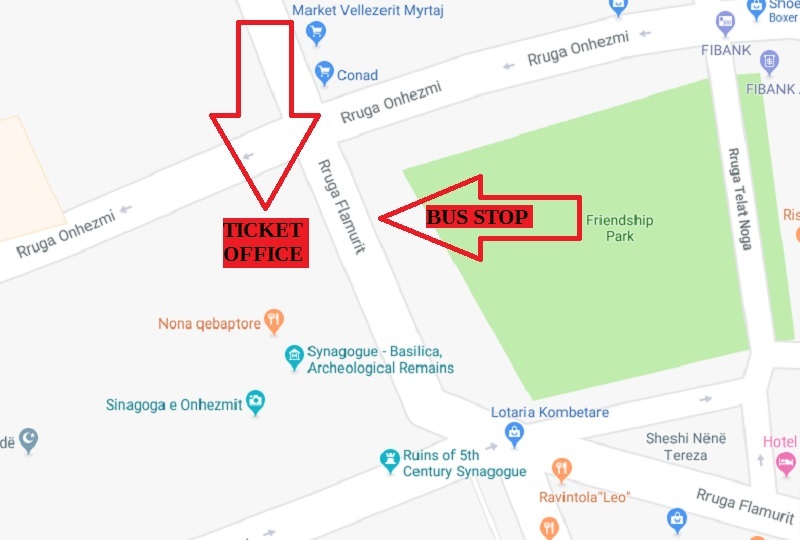 However, if you are standing with your back to synagogue – Basilica and can see the Friendship Park in front of you, you are waiting in the correct place. For some reason, the ticket comes in two parts. Both parts are ripped from a book and stapled together. The date and time of the journey are added to the ticket in pen, along with the seat number. As is normally the case in Albania, you need to pay for your ticket in cash. 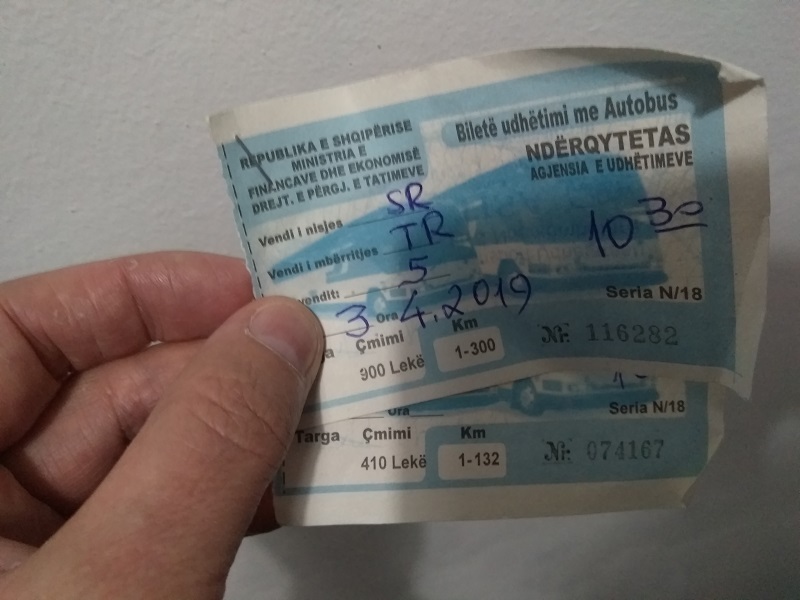 When I bought my ticket, I paid in Lek, but most places in Saranda are happy to accept Euros instead, so I’m guessing this will probably be the case with the bus ticket office as well. If you are planning on making this journey, the other thing to know is you won’t be able to buy your ticket too far in advance. I tried to buy a ticket a couple of weeks early and was told it was too soon to do so. Judging from my own experience, I would say you can only buy a ticket when your date of travel is less than a week away. This makes sense when you think about it. With a system that relies on pieces of paper, it could lead to confusion and mistakes if too many sheets were in use at the same time. There are no toilets on the bus, so it’s best not to have a lot to drink before you travel. The journey takes around four-and-a-half hours, but there is no need to sit crossed-legged all of that time. The bus stops at a cafeteria half-way through the trip. There is a 20-minute rest period. That’s plenty of time to use the bathroom and have something to eat and drink if you dare. As for Wi-Fi on the bus, forget it. There is none. The same can be said for electrical sockets so, if you want to charge your phone, you will be out of luck. The ticket does not state exactly where the journey terminates and the information is not available online. It’s not possible to make an educated guess about it either because there are such a lot of bus stations in Tirana. However, now I’ve made the journey, I know the answer and am happy to share. The bus from Saranda travels to the Regional Bus Station-South Albania [MAP]. It only for buses travelling to and from cities in South Albania and it’s quite some distance from the main area of the city. It’s a pretty long walk and there is no Uber in Tirana, but there’s no need to wear out your shoe leather unnecessarily if you don’t want to. There are plenty of taxis and you are likely to find the drivers approach you before you have time to retrieve your luggage from the bus’ hold. Travelling between Saranda and Tirana via the coastal route is probably a memorable experience, but it wasn’t an option in my case because I was travelling so early in the year. I have no regrets. 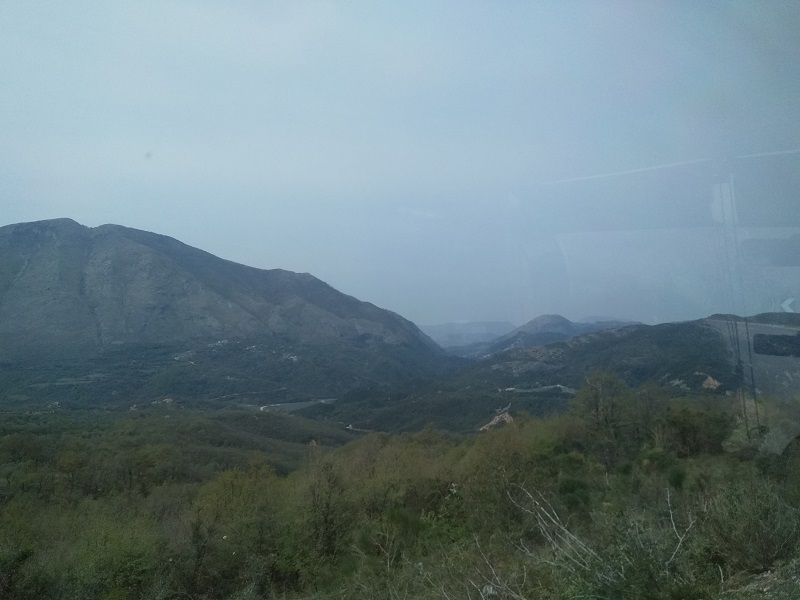 I enjoyed the journey through the Albanian mountains and countryside. The bus also passed through some interesting cities. Albanian people are extremely friendly. The man in the seat next to me kept sharing information about the things we passed on the way. It was like having my own personal tour guide. When we stopped at the halfway point, he paid for my coffee before I could do so myself. I said that was very kind. He said, “You are a guest in my country.” He actually wanted to buy me some rakia (Balkan brandy) as well, but I declined the offer because I wanted as little fluid in my bladder as possible. Early in the journey, there was a stream running parallel with the road. The water was so clear I was amazed. Later the bus passed through mountainous areas that provided views of rivers that looked incredibly blue. The journey from Saranda to Tirana was one of the best bus journeys of my life. It was also the cheapest and four-and-a-half hours is not so long. When I travelled with FlixBus from Prague to Bucharest, the journey took 24 hours and gave me a numb bum. 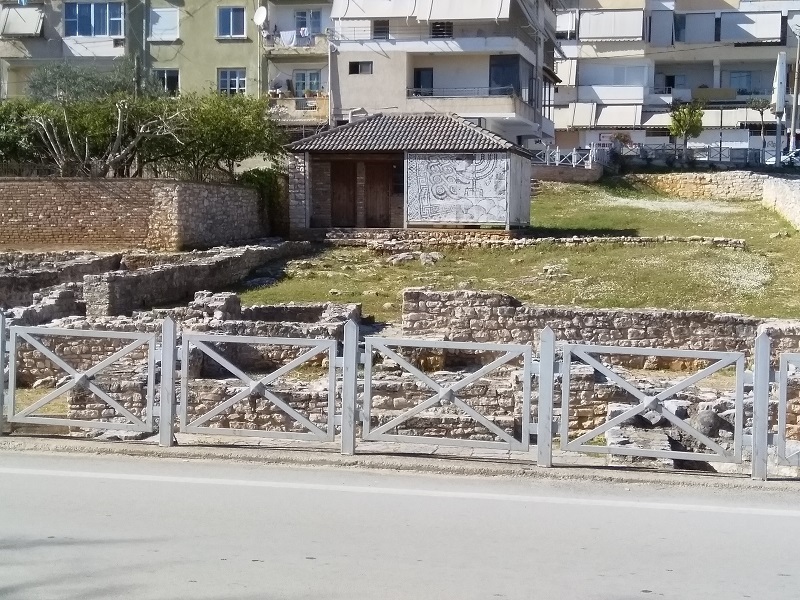 When I arrived in Tirana my bum felt just fine and, thanks to the fact that I’d not had much to drink, there was no need to go looking for a toilet the moment I got off the bus.